California Pacific Medical Center (CPMC) is made up of four of the oldest medical centers in San Francisco, consisting of the California Campus (previously known as the Children's Hospital of San Francisco), Pacific Campus (previously known as the Pacific Presbyterian Medical Center), Davies Campus (previously Ralph K. Davies Hospital), and St. Luke's Campus. CPMC was formed in 1991 by the merger of Pacific Presbyterian Medical Center and Children's Hospital of San Francisco. Ralph K. Davies Medical Center became the third campus of CPMC in 1998 and St. Luke's Hospital became CPMC's fourth campus in 2007. Each of the four campuses contain a hospital and an emergency department which provide inpatient and outpatient services. In addition to the hospital campuses, CPMC owns and/or operates multiple outpatient clinics, a research facility and several other properties more fully described in the most recent Institutional Master Plan (IMP) document. CPMC is one of three hospitals that operate hospital facilities at more than one location within San Francisco (the other two are Kaiser and UCSF). St. Francis Memorial and St. Mary's Medical Center operate as independent facilities, although both are a part of the Catholic Healthcare West (CHW) system. State law (SB 1953) requires that all acute-care hospitals be seismically upgraded sufficiently to remain operational after a major earthquake. CPMC is one of four hospitals in the City currently building new facilities to comply with this law; the other three hospitals are UCSF, SF General Hospital, and Chinese Hospital. Three of CPMC's four acute-care hospitals must be rebuilt or de-licensed in order to comply with state law: the California, Pacific, and St. Luke's Campuses. The Davies Campus hospital was retrofitted in 2008, enabling this campus to accommodate acute-care hospital services until 2030. 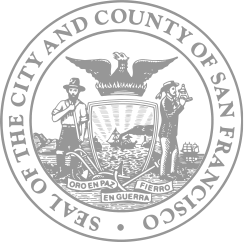 The Planning Commission certified the environmental impact report (EIR) and approved CPMC's Long Range Development Plan, including the construction of new hospital and related facilities at the Cathedral Hill (now called Van Ness and Geary Campus) and St. Luke's locations, on May 23, 2013. 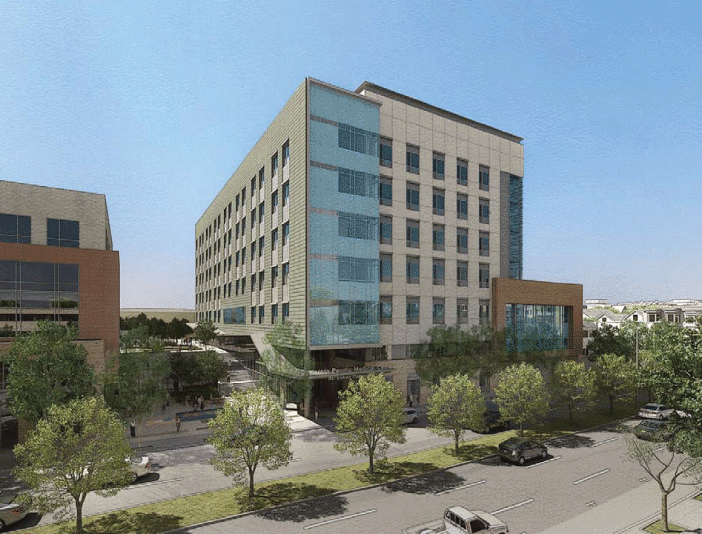 The Board of Supervisors adopted enabling legislation and approved a Development Agreement outlining the terms and requirements under which CPMC must build and operate its new facilities on July 11, 2013. Guerrero Park was originally installed in 2009, through a community-led effort, as a temporary traffic calming project. As part of their Development Agreement with the City, CPMC has committed to install permanent improvements at this site. CPMC, design firm HOK, and SF Planning will be working together with the community to design and implement a great open space that will serve as a southern gateway to the Mission Neighborhood, as well as a green pedestrian haven for residents and visitors to enjoy. The first public workshop session was held on November 29th where some initial input was gathered: Desire for safety buffer along Guerrero, flexible space for movie screenings or farmers market, as incorporating a focal art piece, and some low maintenance children's play equipment and fitness equipment nearest San Jose Avenue. Our next input sessions will be on Sunday, January 28th from 10am to 2pm in the park. Please join us and help us create San Francisco's next great open space! Approved Ordinances (Signed July 11, 2013) Ordinance No. The Draft Environmental Impact Report and the Comments and Responses together constitute the Final Environmental Impact Report. Revised Van Ness & Geary Campus hospital. 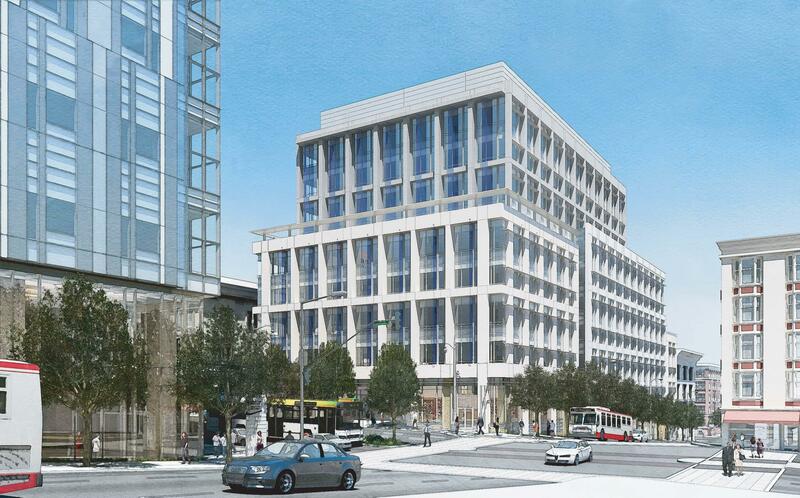 Proposed Van Ness & Geary Medical Office Building. The site of the future Van Ness and Geary Hospital was formerly the site of the Cathedral Hill Hotel and Office Building. The site occupies a full city block – bounded by Van Ness Avenue, Geary Boulevard, Franklin Street, and Post Street – and contains approximately 106,000 square feet of lot area. The site is located within the RC-4 Zoning District (Residential-Commercial, High Density), Van Ness Special Use District, Van Ness Automobile Special Use District, and 130-V Height and Bulk District. Construction of the new hospital began in 2015 and is expected to be completed by 2019. 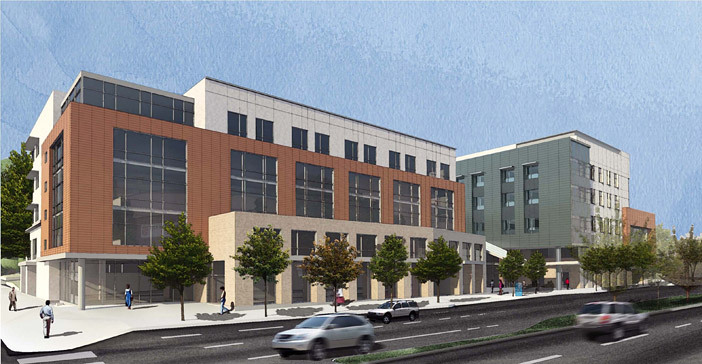 The site of the planned Van Ness and Geary Medical Office Building (MOB) is located on the east side of Van Ness Avenue, between Geary and Cedar Streets. The site contains seven parcels, totaling approximately 36,000 square feet of lot area. The existing structures contain a variety of ground floor commercial uses (most of which are vacant), with a total of five residential dwelling units and 20 residential hotel units above the ground floor uses. The MOB site is located within the RC-4 Zoning District (Residential-Commercial, High Density), Van Ness Special Use District, Van Ness Automobile Special Use District, and 130-V Height and Bulk District. The Van Ness and Geary Hospital will be an approximately 226-foot tall, 730,888-gsf, 274-bed acute-care hospital, with an underground parking garage. All vehicular access to the patient drop-off and parking levels will be mid-block from Geary Boulevard and Post Street, with emergency vehicle access from Franklin and Post Streets. 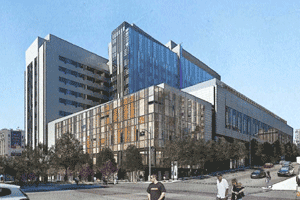 CPMC is seeking LEED Certification for the Van Ness & Geary Hospital. The Van Ness and Geary MOB will be across Van Ness Avenue from the hospital (west side of Van Ness Avenue) bound by Van Ness Avenue, Geary, Cedar and Polk Streets. The MOB will be nine stories tall, approximately 130 feet tall, and will contain approximately 261,691 gross square feet of floor area along with an underground parking garage. This MOB will be internally connected to the hospital through an underground tunnel that has been constructed below Van Ness Avenue. The MOB is subject to San Francisco's Green Building Ordinance, and will achieve a minimum of LEED Silver. 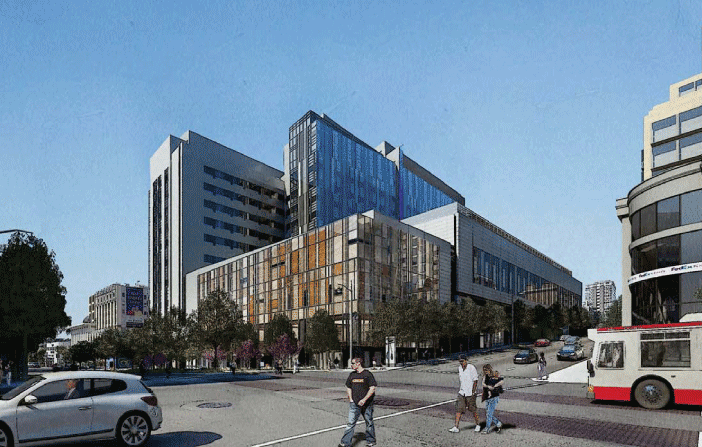 CPMC's Van Ness and Geary campus (Hospital and Medical Office Building) also includes a Streetscape Master Plan in order to appropriately plan and design public realm improvements surrounding the campus. Additional medical office space will be renovated within the existing building at 1375 Sutter Street, which is currently a mixture of retail and office space. There is no physical expansion proposed for this building. 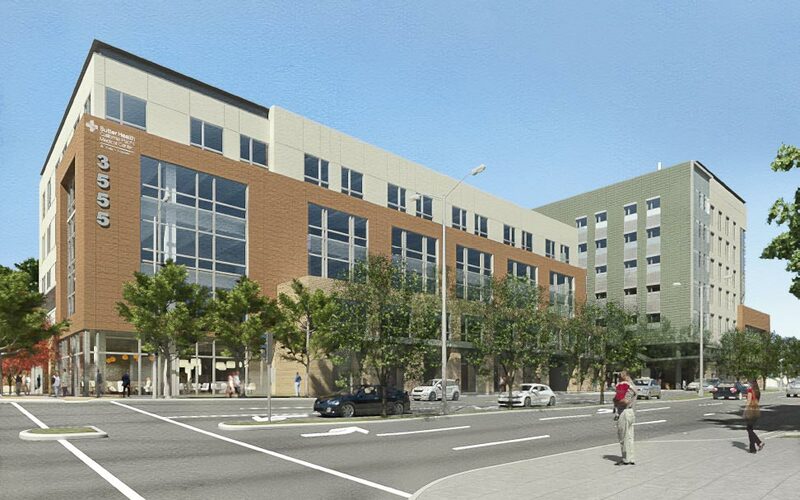 Sutter Health's construction information page for the Van Ness and Geary Campus can be found here. Proposed St. Luke's Medical Office Building. Revised St. Luke's Campus replacement hospital. The St. Luke's Campus is approximately 3.6 acres in size, bounded by Cesar Chavez Street, Valencia Street, Duncan Street, San Jose Avenue, and 27th Street. The campus currently contains eight buildings: the Main Hospital, the 1912 Building, the Monteagle Medical Center, the 1957 Building, the Hartzel Building, the Redwood Administrative building, a portable MRI Trailer, and a parking garage. The total floor space on the campus is approximately 450,000 gross square feet, with 345 existing parking spaces. The St. Luke's Campus is located in the RH-2 Zoning District (Residential House, Two-Family) and is split between the 105-E and 65-A Height and Bulk Districts. In March 2008, following CPMC's acquisition of St. Luke's in 2007, a Blue Ribbon Panel was established in response to CPMC's proposal to close St. Luke's Hospital. The Blue Ribbon Panel was charged with creating a viable plan for an acute care hospital and outpatient services at St. Luke's. The approved plan for St. Luke's Campus includes the construction of a new approximately 142-foot tall, seven-story, 214,061-gsf, 120-bed acute-care hospital. Based on the recommendations of the Blue Ribbon Panel, the new hospital is located to the west of the existing hospital, on the campus' existing surface parking lot and over a portion of San Jose Avenue. Construction of the new hospital began in 2014 and is expected to be completed in 2019. The existing hospital remains operational during construction of the new hospital. Once the new hospital is operational, the existing hospital will be demolished, followed by the construction of a new medical office building/expansion building in a similar location. The new MOB would include approximately 104,000 gross square feet of floor area and be five stories tall. The MOB is subject to San Francisco's Green Building Ordinance and will achieve a minimum of LEED Gold Certification. The St. Luke's Campus also includes a Streetscape Master Plan in order to appropriately plan and design public realm improvements surrounding and within the campus. Sutter Health's construction information page for the St. Luke's Campus can be found here. The Davies Campus is an entire city block, comprising approximately 7.2 acres, bounded by Duboce Avenue, Noe, 14th, and Castro Streets. The Campus currently contains five buildings: the North Tower, the South Tower, the Rehabilitation Center, the 45 Castro MOB, and a parking garage. The total floor space on the campus is approximately 500,000 gross square feet, with 490 existing parking spaces. The Davies Campus is located in the RH-3 Zoning District (Residential House, Three-Family) with 65-D and 130-E Height and Bulk Districts. CPMC has completed several construction projects over the last few years at the Davies Campus, including the seismic strengthening of the North Tower. Rehabilitation of Davies' acute-care hospital allows it to operate until 2030 under the requirements of SB 1953. Additional projects include the Archibald/Ehrenberg Rehabilitation Terrain Park and the consolidation of the geriatric psychiatric program from the Davies Campus to the Pacific Campus in 2010. 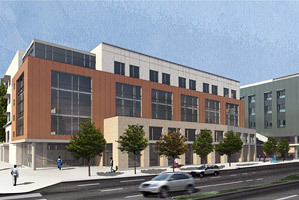 In addition to ongoing upgrades at the North and South Towers, the major plans for the Davies Campus over the next 15 years include the construction of two medical office buildings: the 46,006 gross square foot Neuroscience Institute (the Noe Street Medical Office Building) and the Castro/14th Street Medical Office Building, which would replace the existing parking structure at the corner of Castro and 14th Streets with new medical offices and underground parking. In 2004, CPMC submitted plans to the City outlining the creation of the Neuroscience Institute, which consolidated CPMC's neuroscience programs in a new building at the Davies Campus. This project was not considered part of the proposed CPMC Long Range Development Plan at that time. The Planning Commission approved the Neuroscience Institute project in June 2007; however, in September 2007 the Board of Supervisors heard the environmental appeal and voted to require that this project be evaluated in the context of CPMC's other future development plans. The EIR for the Long Range Development Plan was certified in 2013. 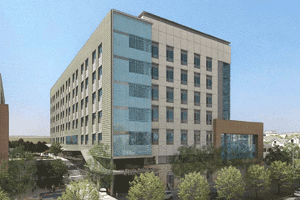 CPMC has not established a schedule for construction of the Neuroscience building. Sutter Health's information page for the Davies Campus can be found here.